When 2,000 union members in West Virginia were forced out on strike for 10 long months in 1989 by the Pittston Coal Company, local union president Richard Trumka thought they should march on corporate headquarters. But it was 900 miles away in Greenwich, Connecticut where his union did not have one member. 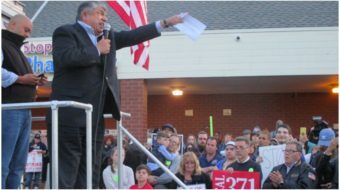 Trumka made a call to John Olsen, the newly elected president of the Connecticut AFL-CIO. Within weeks a giant rally was organized that captured the attention of the nation. “John took us in,” Trumka told a crowd of 700 gathered for Olsen’s retirement dinner. “We won a tremendous strike and saved healthcare for 2,000 families, my mother and dad included,” he said in appreciation. So began a long friendship between the two labor leaders. 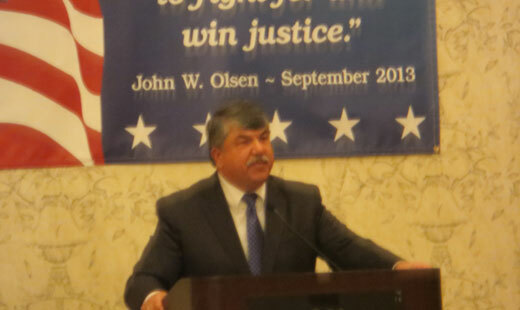 Now president of the AFL CIO, Trumka came to New Haven for the celebration of Olsen’s retirement. “He stood up not just when it was easy, but when it was hard,” Trumka told the packed ballroom of union members, elected officials, family, friends and community leaders, calling Olsen “the best of the best.”. 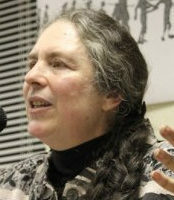 While Connecticut has elected a Democrat majority in the state legislature and all Democrat Congressional delegation, the tea party is seeking a foothold in this state in the 2014 elections. 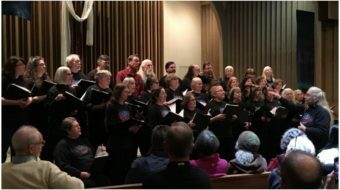 The public expressions of support for labor’s program from these elected officials at the dinner, created a positive climate for new organizing and coalition building. Lori Pelletier, a former machinist who served as secretary treasurer with Olsen, became the new head of the Connecticut AFL CIO last month. She thanked Olsen for his leadership, dedication and mentoring, and also expressed appreciation to his wife Janeen Olsen who retired from her post in the organization. Now president emeritus, Olsen is the group’s longest serving president. He started out as a plumber, became president and business manager of Local 133, and served as secretary-treasurer of the Connecticut State Building and Construction Trades Council. He has served on many boards and commissions and held many political posts. “We’re all brothers and sisters,” said Olsen in acceptance, recognizing a long list of labor leaders and family who influenced his life. “I hope to add my voice on controversial issues in the state and nation. I want to get something done,” he added looking forward. All proceeds from the dinner were shared between the United Labor Agency which serves the families of Hartford area union members in times of crisis, and the Elderly Housing Development and Operations Corporation, where Olsen will serve as a consultant.